Although I’ve made the case for a chief marketing technologist several times before on this blog (my original post, my Search Insider presentation, and my Pivot presentation), the ITSMA interview had some great discussion and pushback on whether marketing should have its own technical staff. ITSMA: How would you suggest that CMOs go about lobbying for their own group of technologists? Won’t the CFO and CEO see this as a potential duplication of resources? Won’t they say that the CMO needs to work harder to get what he or she wants out of the existing IT organization? Brinker: First, this is largely a “net new” set of technology demands. This isn’t about taking existing resources away from IT, and it’s not about duplicating them. It’s primarily a need for new resources. If there’s a tradeoff in resources, it’s largely inside marketing, which increasingly has less need for legacy resources in print advertising, direct mail, event marketing, etc. Those channels are being superseded by digital alternatives. Second, marketing must understand — deeply — how these technologies work (and work together) to apply them effectively in creative and agile ways. They can’t outsource or delegate that know-how in driving modern marketing campaigns. To achieve that, marketing must incorporate native technology talent on its team. It’s not for the sake of doing the kind of work that IT has traditionally done; it’s for the sake of doing an entirely new kind of marketing that uses software and data as a creative medium in its own right. 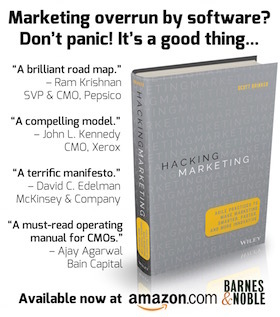 Marketing technologists are a function of an evolving marketing department, more than a reflection or referendum on IT. ITSMA: How will the CMO avoid creating conflicts with the central IT group over turf, authority, budget, and resources? Brinker: I firmly believe that the CIO and the IT department should have governance over all technology in the organization. But there’s a distinction between governance and management that’s important to recognize. A board of directors has governance over a company on behalf of its stockholders, but it’s the CEO who actually manages the company. A CFO and the finance department provide governance over budgeting and expenditures — but it’s the heads of individual departments that manage and apply their own budgets. Marketing needs to directly manage more of its application layer of technology. Marketing technologists, reporting directly to marketing managers, are the people who should implement and operate that layer. However, they should adhere to overarching rules and guidelines established by the IT department as part of the company’s overall IT governance strategy. IT will play less of a role in defining and operating the applications and become more of a consultant to marketing as marketing selects its applications. This governance of a federated structure is not a new concept in IT; it’s been successfully employed in coordinating IT management across different divisions and regions that have differing IT needs. Technology-driven marketing is not a far stretch as a state within such a federation. In such an organizational configuration, the CIO retains the final say in a technology strategy or architecture, but as a day-to-day practice, marketing can run a good portion of its technology within that framework. As for the issue of whose budget, marketing should pay for its marketing technology initiatives itself. To the degree that marketing can leverage other common infrastructure operated by IT, that’s great — such common infrastructure is then clearly under IT’s control. But for technology investments that are marketing-specific, it should be up to the CMO to trade off where money is best spent among software, service, headcount, etc. If the CMO thinks that taking money from an underperforming advertising channel and applying it to enhancements to a marketing automation system will deliver better overall performance on marketing’s objectives, that’s exactly the sort of tradeoff that marketing should be making. The entire article is available here, but again, it’s $195 for non-ITSMA members. Scott, thanks for continuing to carry the torch! Scott, thanks again for the thoughtful posting! I think your post does a great job advocating the special contribution CMOs can make to organizations. In my mind Marketing’s relationship with technology is perhaps the most dynamic in the organization; Marketing must constantly track, validate and adapt to emerging technology trends to ensure the mission of the Organization is executed. To put it bluntly, this is not something to be left to the CIO to accomplish on a part-time basis. I’m somewhat uncomfortable about the CIO “final say” assertion, because I believe the CIO serves the mission of the organization; in that way Marketing et.al. are the CIO’s customers. Thus, I would argue that Marketing should have “final say” over the technologies they can best use to accomplish their goals; traditionally, Marketing has not had the built-in competence to make such decisions. In my view, the role of the CMO is to make Marketing an equal partner in technology implementation within the Organization, to better fulfill its mission.